A few months ago I wrote an essay with Catherine Doyle and Keith Lindsay called "The Conservation Charade: U.S. Zoos Propose Importing Wild African Elephants" about three zoos proposing to import 18 elephants from Swaziland to the United States. As it turns out, these elephants were secretly shipped to the United States on March 8. We are calling them "The Stolen 18." I learned about this in an anonymous email sent to me the same day by a very courageous and compassionate person. I thought that others who are also working on stopping the shipment of the elephants also received the same email, but I discovered they did not. I shared it, keeping the sender's identity confidential, and this got the ball rolling from a number of different people and the media (please see, for example, "US zoos secretly fly 18 elephants out of Swaziland ahead of court challenge" and "To save rhinos, half of this African country's elephants are being airlifted to U.S. zoos"). 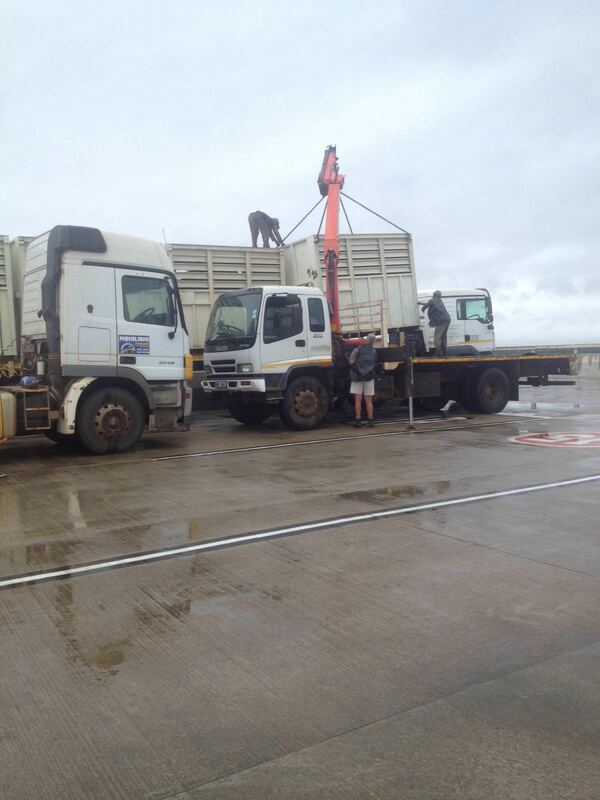 This image is of the elephants in crates being loaded onto an airplane heading to Dallas, Texas. The person who told me what was happening to these magnificent beings sent it to me. The note below was sent to me by Michael Harris, Director of the Wildlife Law Program for Friends of Animals, who had filed a complaint against the transport of the 18 elephants. "The fight to prevent a lifetime of captivity for 18 elephants, 15 of whom are currently under 12 years of age, came to an abrupt and devious end. As was widely reported over the past couple months, three U.S. zoos--the Dallas Zoo, the Sedwick County Zoo in Wichita, Kansas, and Omaha's Henry Doorly Zoo--applied for and obtained from the U.S. Fish & Wildlife Service (USFWS) a permit to import these elephants from the wilds of Swaziland. A lawsuit was filed soon after the permit was issued claiming that that USFWS had a mandatory duty under the National Environmental Policy Act to fully evaluate and disclose whether the elephants, as a result of captivity, would suffer social, psychological, behavioral, and physical impacts for the rest of their lives. The lawsuit, brought by Friends of Animals, was supported by the world's foremost experts on elephants, including Dr. Joyce Poole, Dr. Phyllis Lee, Dr. G.A. Bradshaw, Dr. Marc Bekoff, and the entire board of the Elephant Specialist Advisory Group. Faced with the real possibility of a court finding that the law compels such disclosure (which certainly would have negatively impacted public and scientific opinion about the proposed transfer), the zoos decided to take no chances. Without informing the court or media, a plane was secretly sent from Kansas City on March 5 to retrieve the elephants ahead of a scheduled hearing on March 17 at which time the court was to hear Friends of Animals' legal arguments. That plane landed at approximately 7:30 a.m. local time in the capital city of Swaziland on March 8. If it were not for the brave actions of a local Swaziland person with knowledge of the situation who contacted Marc Bekoff, it is almost certain that we would still not have known that the elephants were to be stolen away before receiving their day in court. As it turns out, this official was able to provide Friends of Animals, within mere hours of the plane landing, with enough information to support a request for an emergency restraining order, which was temporarily granted by the court. Sadly, the zoos had already moved to anesthetize, crate and move the elephants onto the plane. Faced with sparse medical testimony from the zoos' own veterinarians, the court dissolved the restraining order shortly after midnight in Swaziland. The elephants are scheduled to be flown away before another day dawns. The underhandedness of this move cannot be understated. This is the first time since 2003 that elephants have been taken from the wild for purposes of populating U.S. zoos. Since then, our scientific understanding of the impacts that confinement has on elephants has grown tremendously. We know today that they nearly always endure severe physical and physiological hardship, especially when they have spent their entire lives in the wild. Once they reach the zoos and are placed in confinement, they are likely to suffer some of the very same mental and physical conditions one would expect when a human is placed into confinement. They become depressed, lose their appetites, and can become fidgety, dissociative and/or even aggressive. Moreover, it is well documented that captive elephants have a much greater chance of developing health problems and dying at a much earlier age when they are transported overseas and endure these stress factors. This not something that the three zoos involved here wanted to see, a court order for the USFWS to take into consideration. As such, they decided to sneak in and steal away these 18 under the darkness of night. Let's not forget their sacrifice, and let them be the last elephants to ever again endure such a fate in the U.S."
Good luck to these amazing beings who do not belong in zoos. They're simply and regrettably going to be used as trophies to generate money. The secret shipping of these magnificent animals reeks of the wildlife trade, illegal or not. And, similar to the killing -- "zoothanizing" not euthanizing -- of Marius, a young giraffe at the Copenhagen Zoo because he was no longer useful to their breeding program, the behind the scenes shipping of these elephants has generated a lot of interest globally, even by people who never before got involved in animal protection. I called the killing of Marius "The Marius Effect" because it generated widespread concern, and the secret transport of these elephants can be called "The Swazi Effect" because it too is generating a lot of concern among people worldwide. Shame on the people involved in this clandestine transfer of these magnificent intelligent, social, emotional, and sentient beings.